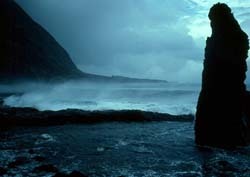 Cave Point, the Caves and Stony Hill are on the south coast of Tristan da Cunha, and are home to herd of wild cattle. They are normally visited by sea. View from the edge of the base with the promontory of Cave Point and the barren Seal Bay Plateau. The small buildings are camping huts and storage sheds used by islanders on trips to this favoured 'holiday place.' Cave point is home to Tristan's largest modern colony of Antarctic Fur Seals. 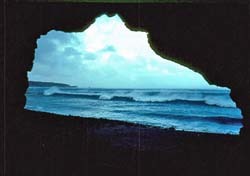 Archway Cave is one of several caves cut by the sea in the volcanic rock and once used by islanders to shelter overnight whilst on hunting trips or occasionally to shelter on return from Nightingale when sea conditions were too rough to risk a landing at the settlement. 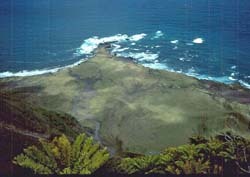 View from near Cave Point across Seal Bay to Deadman's Bay and the 18th Century volcanic cone and lava flow of Stony Hill forming the peninsula skyline. There is a herd of wild cattle that breed around Stony Hill and are owned by local families. Trips by boat 'for meat' occur every year.